It is with much sadness that we announce the passing of Biscuit Acres’ first mascot at the age of 13. 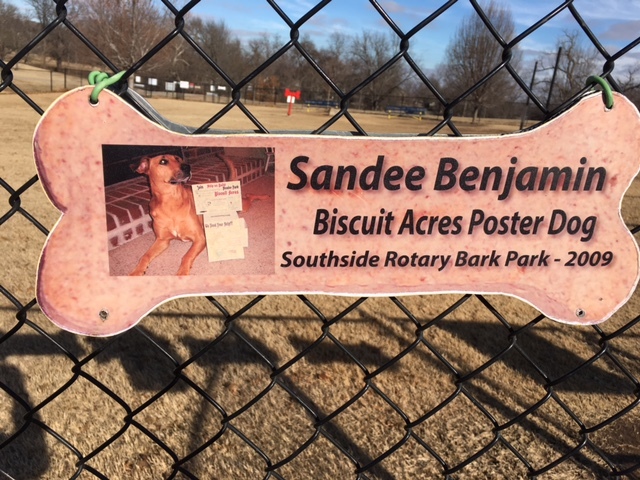 Sandee was a Ridgeback mix who belonged to Biscuit Acres Volunteer Association’s Treasurer, John Benjamin. She was adopted at age 1 and at 5 she was the lead dog in helping Southside Rotary Club raise the first funds for Biscuit Acres Dog Park. Also, she was an accomplished Agility Competitor for 4 years. R.I.P. Sandee. Previous Previous post: Welcome to Biscuit Acres Dog Park! Next Next post: Our New Elm Tree!